← 5 Ways to use Garlic Scapes! Last week we were gifted by a friend that was slowing down her rabbit breeding plans, a four hole grow out set up cage and a two hole mom with full nest box attached to each end set up. The timing was excellent as I had grown out’s in an outside feeding tractor that needed to be sexed and moved apart (they will finish out this month for butchering timing) and I have right around 40 four, coming five-week old kits that are all eating and do well whose mother are more than ready to wean them. So I have two does that are ready to pop kits this coming week, they went to the new doe cages with attached nest box’s and the one has declared it most excellent and has even been spotted with a hay mouthful as she is in fuss mode.. The second doe moved is giving me the eye.. she liked her bigger outdoor hutch I think but she will settle.. that big old 16 square feet hutch is being used as grow out hutch at the moment. The four grow out hole wire hutch that is a hanging type that is now inside, the Croft (barn) has nice big getting there grow outs at three per pen (legally I can put five per pen, but no need for crowding) so three does in two and three bucks in the other and I have an outstanding doe in the one pen.. she is massive, her growth rate is off the charts, her whole litter is excellent but she is heavier than the bucks and is going to be like her mother.. HUGE.. I plan to keep her back and see how she continues to age out.. it was be a sad day if you butcher out a doe that has that kind of possibility in her genes for getting you whole litters and kits to butcher size up to a week earlier then what you currently have.. that add’s up to a whole lot of food in the freezer in the end and lot less time and food output to get there.. So today we re-bred the other three does.. ( I have a total of five does) for litters in a month and weaning a month after that.. which means that I have time to butcher the oldest, finish growing out the just weaned now before those new kits in two months will need to be moved to their grow out pens. As I stood looking at quiet calm, eating, resting, grooming themselves rabbits, I Said to DH, well there is our chicken this year dear..
As it turned out, in our chick’s, we only have three roosters.. one that I will be keeping back, leaving me with just two chickens to butcher this year.. so truly for white meat.. rabbit is the white meat of 2017. I expect that I will have one more breeding for the fall and then just put all the girls on a healthy but lean winter diet and put deep winter breeding on hold.. I have the boy’s in rabbit tractors but Dh and I are in agreement that we are going to design and built a two hole buck hutch for them. I like having two unrelated males, and five unrelated females at the moment. It gives me lots of room in my breeding programs. 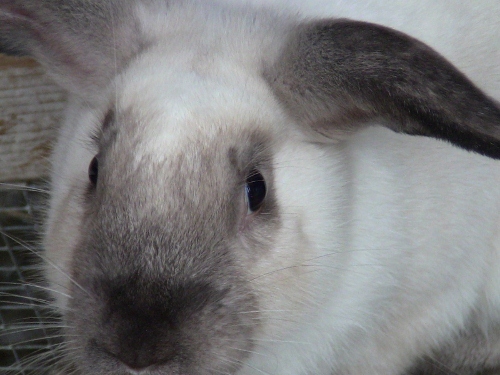 This entry was posted in rabbits and tagged Breeding rabbits on the homestead, Rabbits, raising rabbit for meat. Bookmark the permalink.